Can you make it through this post without drooling? Doubt it. 1. 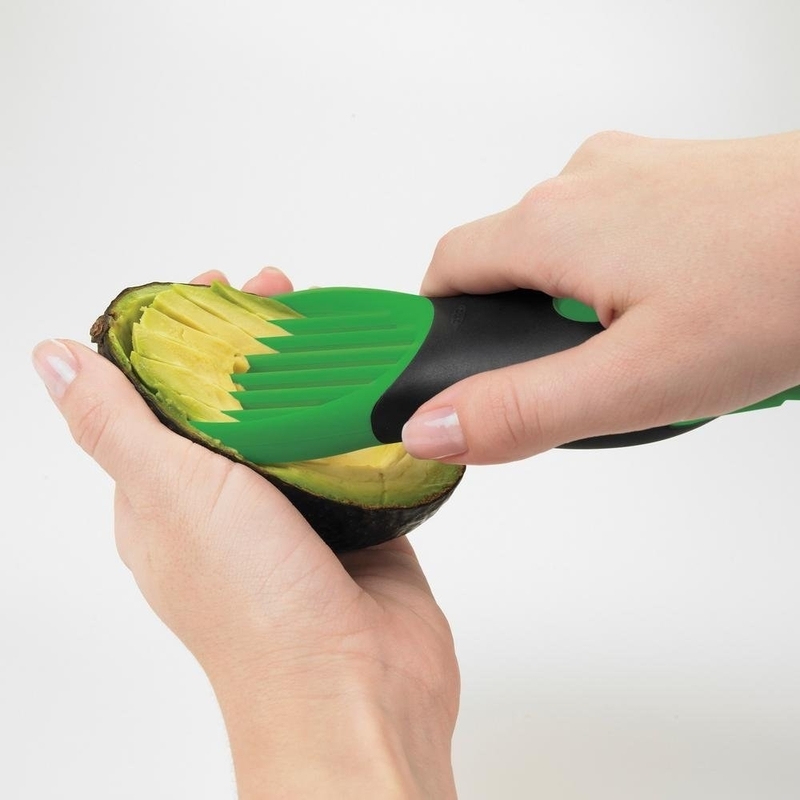 A three-in-one avocado slicer for a functional way to split, pit, and slice nature's butter. 2. An air fryer to transform your fave foods into fried food, without all the yucky grease and oil. All you have to do is put your food in the fryer basket, set the temp and the timer, and your food will come out crispy and delish. The auto-shutoff feature will help prevent overcooking, and the cool-touch handle means no hand burns when pulling your food out. Comes with a recipe book for inspo! And if you need further convincing, check out a BuzzFeeder's review (#1) here. 3. A sous vide precision cooker that'll make restaurant-quality meals an every day occurrence in your home — we're sure your friends and family will give you a five-star rating. Sous vide (for those of you who are like, "WTF is that?") ensures even heating while cooking, and this one is extra special because it'll literally send notifications to your phone when your meal is ready via Bluetooth connectivity, so you don't have to sit around waiting. 4. A four-pack of plastic cutting boards for ensuring each ingredient has a designated place for prepping, because we don't cross-contaminate in this house. 5. A KitchenAid stand mixer to help you in your quest to make ALLLLLLLL the delicious baked goods. This baby will last you a long time, so it's VERY much worth the investment, trust us. This stand mixer has 10 different speeds from very slow stir all the way to very fast whip to meet all your prepping needs. It comes with a flat beater, a dough hook, and a wire whip. It features a 5 quart stainless-steel bowl, a head tilt back for easier access, and a two-piece pouring shield. If you wanna learn more about this amazing mixer, check out this article. 6. Reusable silicone baking cups that'll be honored and excited to mold and hold together your cupcakes and muffins — not to mention make them look v colorful and pretty. Made with food-grade silicone, and are microwave-, freezer-, dishwasher-, and oven-safe (in temps up to 500ºF). 7. A microwave omelette maker for when you really, really, REALLY want a filling, tasty omelette for brekkie, but have zero time to stand over the stove top waiting for the eggs to cook. This is made of 100% platinum silicone that's resistant to high temps and is dishwasher-safe, plus it comes with a recipe booklet for inspo! 8. A seven-blade spiralizer to transform your boring ol' veggies into delicious PASTA — whip together in a saucepan with some marinara sauce, and voila! Comes with seven interchangeable blades and four e-books filled with delish recipes; the spiralizer has a lifetime warranty and is easy to take apart for top-rack dishwashing. 9. A breakfast sandwich maker that'll allow you to enjoy a scrumptious breakfast that's perfect to bring on-the-go — without sitting in line at the McDonald's drive-thru. Only takes about five minutes to make your breakfast sandwich. The surfaces are covered with durable, nonstick coating, and all removable parts are dishwasher-safe. Comes with some recipes for inspo, and PSA: If using meat, it must be pre-cooked. 10. A can opener for simply opening cans of soup, veggies, tuna, etc., because it would be sorta pointless buying cans of food if you can't open them, ya know?! Can open all standard-size cans with pop-top lids. 11. A digital scale to ensure you're measuring the proper quantity of ingredients, because the wrong amount can often make or break your whole recipe. Can weigh up to 11.24 lbs. of food, and an automatic unit button allows you to easily convert measurements as needed. Includes trial batter, but once they run out, you'll need two AAA batteries — Polaroid AAA batteries are recommended. Also, has an automatic power-off feature after two minutes to preserve battery life. 12. A cast-iron skillet that'll proudly sauté, sear, and fry your breakfast, lunch, dinner, snacks, and everything in between! Skillet comes pre-seasoned and ready to use. Handle of skillet has a hole so you can hang the skillet when not using. To clean, hand-wash with warm, soapy water. 13. A set of stainless steel measuring cups and spoons for getting the exact amount of dry ingredients every. single. time. Measuring cups include one 1 cup, one 1/2 cup, one 1/3 cup, and one 1/4 cup. Measuring spoons include one 1 tbsp., one 1 tsp., one 1/2 tsp., and one 1/4 tsp. All are dishwasher-safe. 14. A salad spinner to quickly clean your greens, so you can use them to make creative and yummy salads, or any other dishes you plan on using lettuce in! Made with a soft, non-slip knob and a non-slip ring with a wide base for steady spinning. The clear bowl can be used for serving while the basket can be removed and used as a separate colander. It holds up to 6.22 quarts of delish salad. Plus, it's BPA-free and top-rack dishwasher-safe. Yields up to four servings at a time, and is top-rack dishwasher-safe. 16. A three-piece glass mixing bowl set for combining your ingredients before they eventually come to life in a beautiful, mystical way. Set includes one 1 qt. bowl, one 1 1/2 qt. bowl, and one 2 1/2 qt. bowl. Bowls are made of pure Pyrex glass and are microwave-, dishwasher-, preheated-oven, and freezer-safe!. They won't stain or absorb yucky food odors, or catch left-behind flavors. 17. 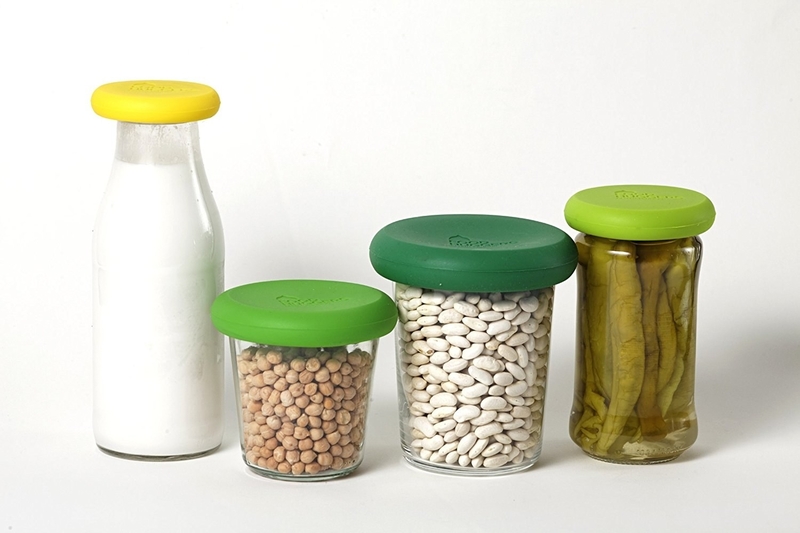 A four-pack of silicone food savers to preserve the freshness of unused produce or seal opened jars, because it would be sad if you were forced into throwing away food because it spoiled before you had a chance to eat it. Includes four BPA-free and dishwasher-safe huggers in each of the following sizes: 1.75 inch, 2.25 inch, 2.5 inch, and 3 inch. 18. A grease splatter screen that'll keep your face, hands, and clothes protected from the unwanted and painful hot splatter that occurs pretty much whenever you're just trying to cook something delicious, damnit. 19. An Instant Pot for making a variety of foods like rice, yogurt, and slow cooker creations without needing to stand around and wait over a stove. Features 14 built-in smart programs, dual pressure, an automatic keep-warm feature, and three temps. Has a manual setting of up to 120 minutes cook time. Includes three-ply bottom stainless steel cooking pot, a stainless steel steam rack with handle, and recipes! 20. A heavy-duty veggie chopper to take your cooking-prep game to the next level — so the only crying you'll find yourself doing will be over how happy you are you don't have to cut the onions yourself. For real, though, this fancy-schmancy babe reduces onion vapors, so you really can stop crying. It holds up to 4 cups of chopped veggies and is FDA-certified, BPA-free, and dishwasher-safe. 21. A two-pack of silicone baking mats that'll provide a nonstick surface for your next batch of baked goods, so you can enjoy the entire cookie yourself (not share it with the pan). 22. A Ninja blender for whipping up delicious smoothies, or even margaritas or daiquiris if you're 21+ (virgin versions if you're not of legal drinking age yet, of course). The possibilities are endless! Blender has three speeds, a pulse option, and single-serve functions. It comes with two 16 oz. cups with to-go lids so you can take your drinks on-the-go. Plus, it's BPA-free and dishwasher-safe. Get it from Amazon for $99.98 (originally $109.99). 23. A dessert decorating tool to upgrade your baked-goods game. Did you make that or get it at the fancy bakery down the street? 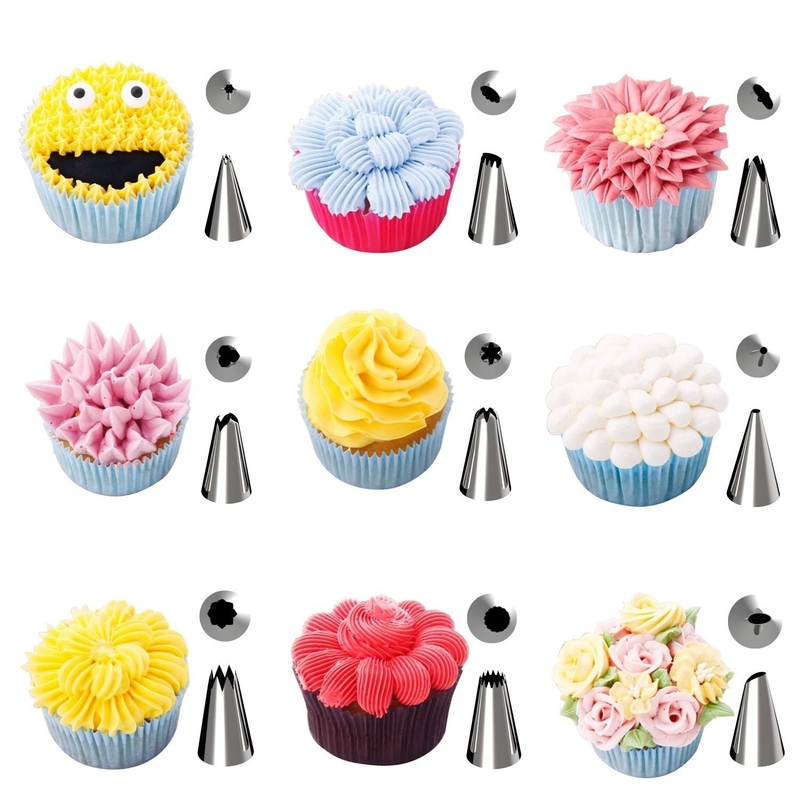 Includes four decorating tips, a fill tip, and two couplers, and is compatible with most standard Wilton tips. The cylinder, bottom rings, tips, and couplers are top-rack dishwasher-safe, while the plunger assembly should be hand-washed. 24. A rapid egg cooker that'll quickly yield yummy eggs in your favorite style — scrambled? Check. Soft boiled? Check. Omelet? Check. Poached? Check. Hard boiled? Check? Need this immediately? Check. Features an auto-shutoff function to prevent overcooking. A buzzer will alert you once your eggs have finished cooking. Includes a one-year warranty. The product comes with a poaching tray, an omelet tray, a six-egg holder tray, a measuring cup, a recipe book, and online recipe database access. All non-electric parts are dishwasher-safe. In case you need a little more convincing, check out this article! 25. A microwave rice cooker for whipping up rice easily and efficiently, because everyone knows any meal isn't complete until it has rice! Steamer can hold up to 11 cups of rice and comes with lid-locking clips, a steam release vent to prevent splatters, and a rice paddle for serving. Made with 100% virgin plastic, and is phthalate- and BPA-free. It's also microwave-, fridge-, freezer-, and dishwasher-safe (top rack only). 26. A 12-piece knife set to cut through all of your food like cutting through air — honestly! These gorgine babies are actually hella powerful so BE CAREFUL! Set includes six knives with corresponding covers – an 8" chef knife, an 8" slicing knife, an 8" serrated bread knife, a 7" santoku knife, a 6.5" utility knife, and a 3.5" pairing knife. 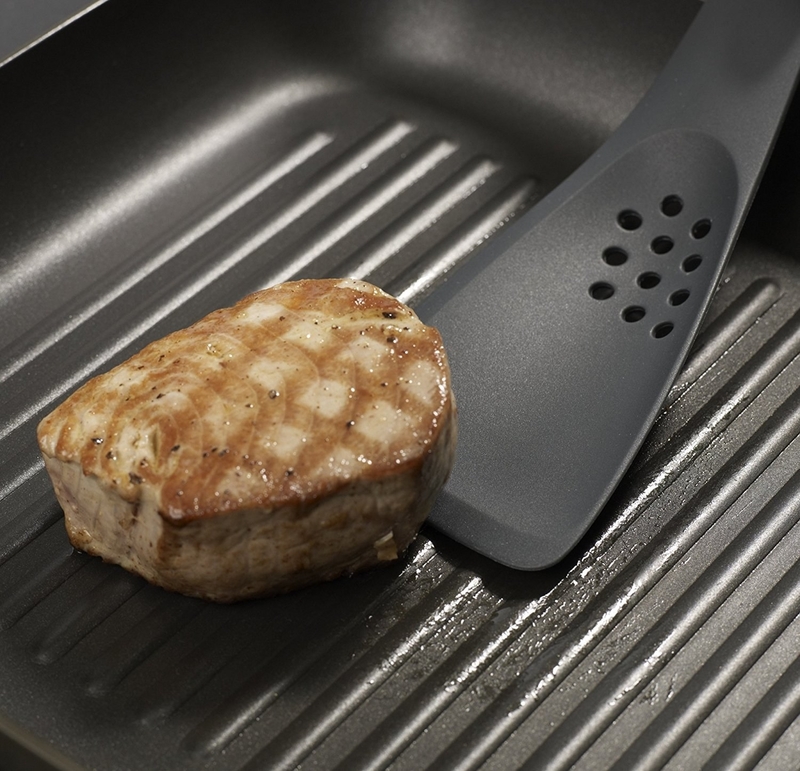 A non-stick coating makes slicing any and all foods less of a hassle. Best to avoid putting in the dishwasher or cleaning with hot water – cold water is recommended. If you need one more push to be convinced, check out this BuzzFeeder's review! 27. A cold-brew maker that'll yield the most tasty, iced caffeinated treat — it's a must if you're anything like me and think of coffee as your lifeline. Yields about four servings of delicious coffee. Features an airtight, leak-proof lid that helps to lock in freshness and flavor, a non-slip silicone handle, and fits in most refrigerator door. Plus, it's dishwasher-safe and BPA-free. 28. A pizza cutter wheel for a clean cut slice of goodness, because apparently picking up the entire pie and devouring it is frowned upon. Pizza cutter is dishwasher-safe and comes with a lifetime money-back warranty. 29. A mini griddle to cook up mouthwatering meals like pancakes, eggs, grilled cheese, and more. Includes a one-year warranty, a recipe book, and online recipe database access. All non-electric parts can be wiped clean. 30. A cauliflower prep tool that'll help you chop off the stalk of not only cauliflower, but also broccoli and other veggies so you can be on your merry little way toward making something drool-worthy. This tool features an ergonomic handle that'll be easy on the wrist while using, so those with arthritis can use it without worry. It's dishwasher-safe and easy to store. 31. A cooling rack for giving your baked goods some much-needed space to take a chill before you eat them. It was hot in the oven, damnit, and they deserve a breather. 32. A waffle-stick maker to test the scientific findings that waffles taste infinitely better when they're in stick form. Yields four waffle sticks at a time. Features nonstick baking plates, a power light, a latching handle, non-skid rubber feet, and a cord wrap. To clean, wipe down the trays with a damp cloth. 33. 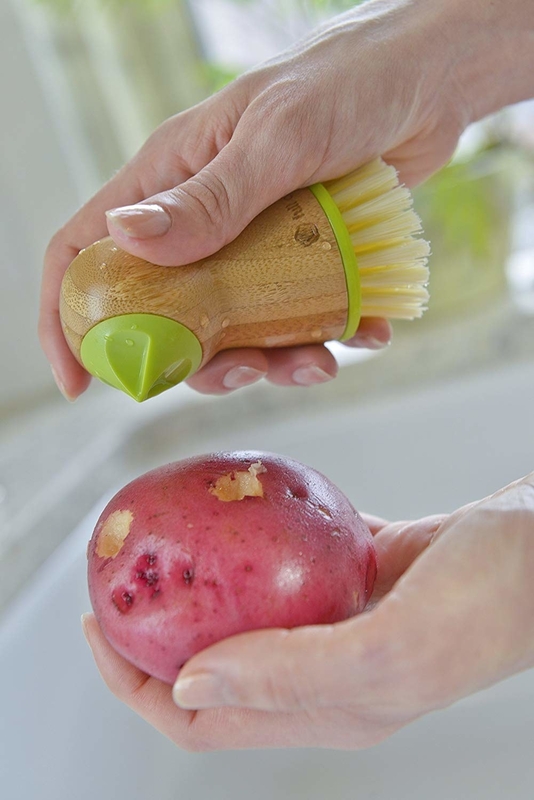 A potato brush featuring an eye remover that'll clean and prep your potatoes before it's time to turn them into baked potatoes, mashed potatoes, or...wait for it...FRENCH FRIES. Brush is BPA-free and made with bamboo and recycled plastic. Features durable, stainless steel blades to effortlessly strip the kernels and is top-rack dishwasher-safe! 35. A swivel peeler that'll defeat half the battle when it comes to chowing down on fresh produce — getting rid of the skin. Now you have no excuses! Made with a soft, oversized handle with a comfy, non-slip grip so it's easy to use and hold. Dishwasher-safe. 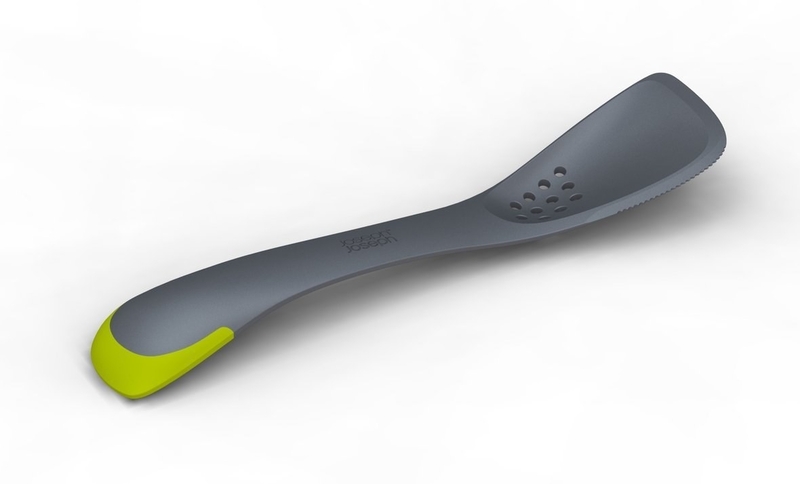 Promising review: "Great and really sharp peeler. Just glazing on the surface with the bare minimum strength of forward motion and it would cut off the skin. The strip is quite thin compared to my old standard peeler. Family was so impressed that they wanted to order another one on the very same day I received the first one." —H. N.
36. A digital meat thermometer to get a fast, accurate, and easy-to-see temperature reading so you know if your dinner is ready to be eaten or needs a lil' more time in the oven. Gets a temperature reading within four to seven seconds, and is made with food-grade stainless steel. Temperature reading ranges from -58ºF to 572ºF. Comes with a AAA battery. 37. A whale strainer for getting water out of the pot while keeping pasta in — and this can do so pretty whale. As if the fact that it's a whale weren't enough reason to buy it, it's also BPA-free and dishwasher-safe. 38. A 42-piece cake decorating kit to make your baked treats look as good as they taste. 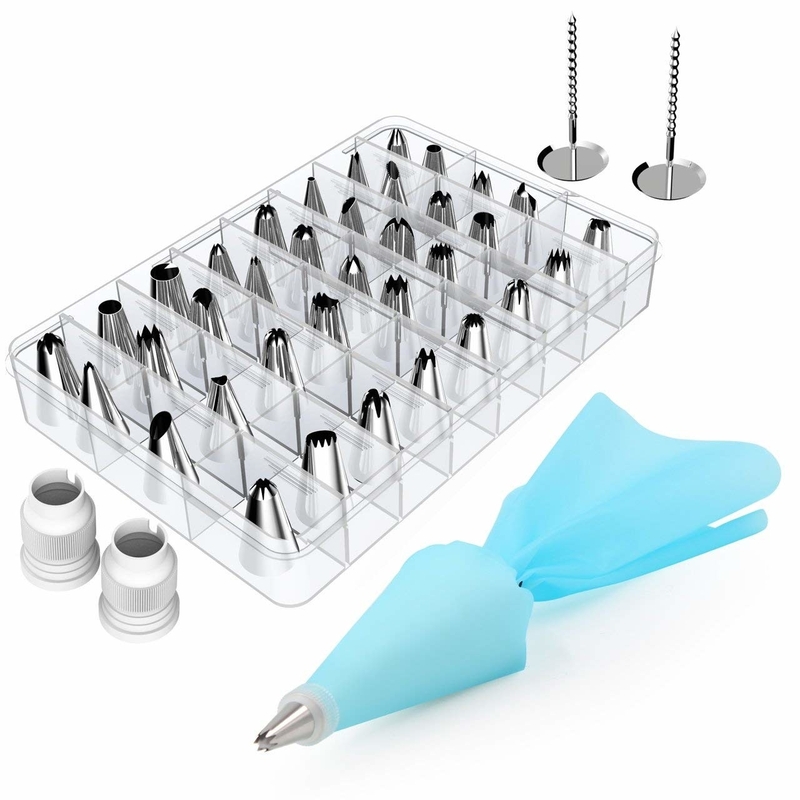 This set includes 36 stainless steel icing tips, 2 reusable silicone pastry bags, 2 reusable plastic couplers, and 2 flower nails, allowing for various types of patterns on baked goods. Patterns included in kit: 11 open-star tips, 7 closed star tips, 3 French tips, 3 round tips, 2 plain tips, 4 leaf tips, 3 rose petal tips, and 3 special tips. Time to get to a baking. 39. A pair of claws for shredding your meat in a less messy way, because shredded meat, by default, just tastes better than any other kind of meat. Don't @ me on this. These are melt-proof, made of BPA-free nylon, are FDA-approved, and heat-resistant to temps up to 475ºF. Plus, they're dishwasher-safe! 40. A garlic peeling/mincing/crushing set to ensure adding garlicky goodness to all of your dishes is not just easier, but basically a requirement. This is FDA-approved for food safety, so go ahead and crush all the garlic your heart desires with peace of mind! You can also use this to mince ginger and chop nuts! Plus, it's dishwasher-safe! 41. A five-in-one tool that'll act as a slotted spoon, a solid spoon, a spatula, a turner, and a cutting tool, because we stan a multipurpose tool under $10. This tool is made from tough nylon and is heat-resistant to temps up to 480ºF, and it's dishwasher-safe. 42. 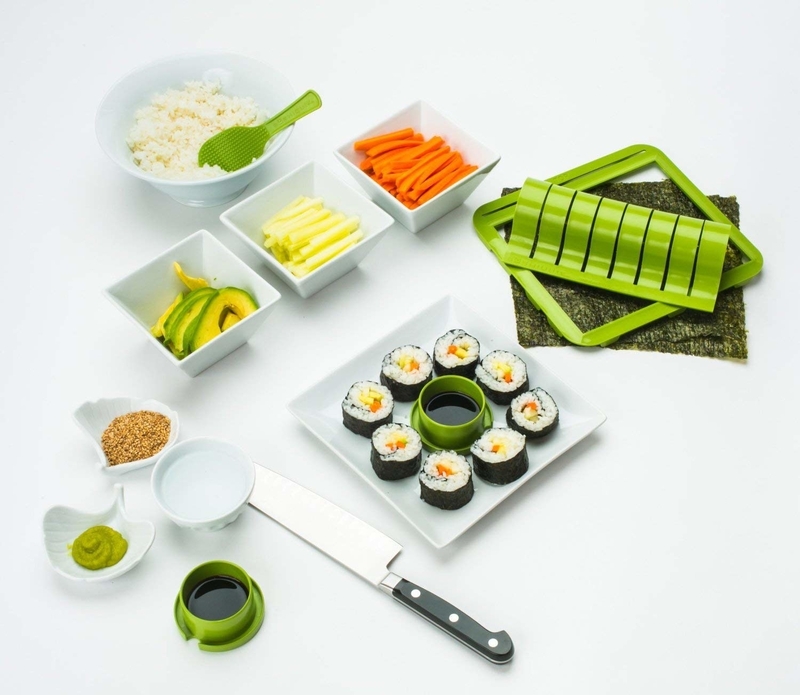 A sushi-making kit for making your own creations in the comfort of your own kitchen — just think of all the fun combos you can whip up! 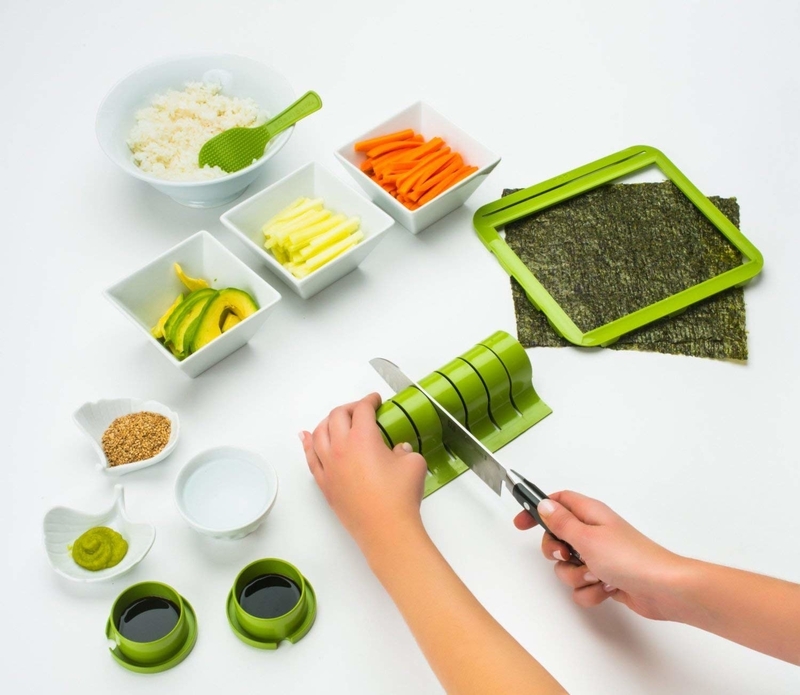 Includes training frame, nonstick paddle, and the SushiQuik Roll cutter. It can make all roll sizes, includes rolls with rice on the outside. Plus, the sushi mat is detachable so it can be put in the dishwasher. 43. An egg cracker/separator to ease the task of getting the yolks and whites out of the egg and separating the two. This can open both fresh and hard-boiled eggs, and is top-rack dishwasher-safe. Promising review: "A fun-to-use and very useful product! This may seem funny but it works just great every time and keeps you from making a mess when breaking eggs!! I love this little gadget. Some things are just gadgets that you may use a couple of times and that is it, but this really does make it fun to use and I think you'll find yourself using it many times over and over!" —mark c.
44. 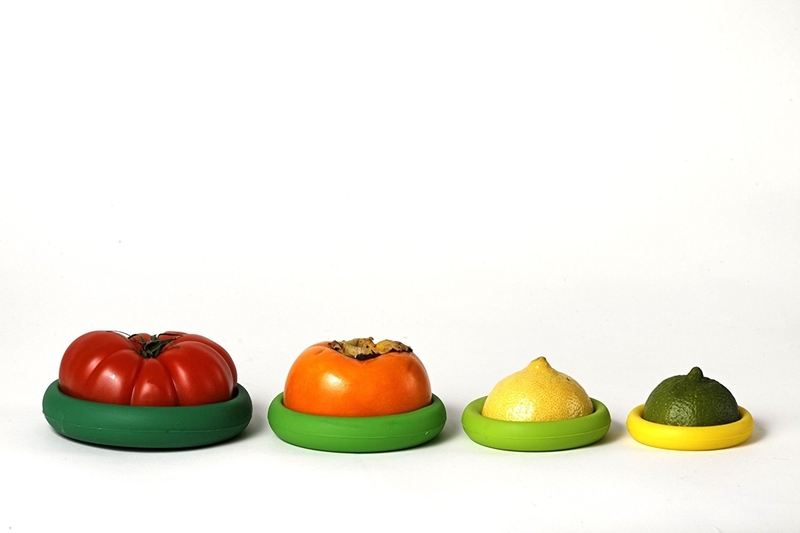 A citrus juice presser that'll help extract every last drop of juice from fruits. 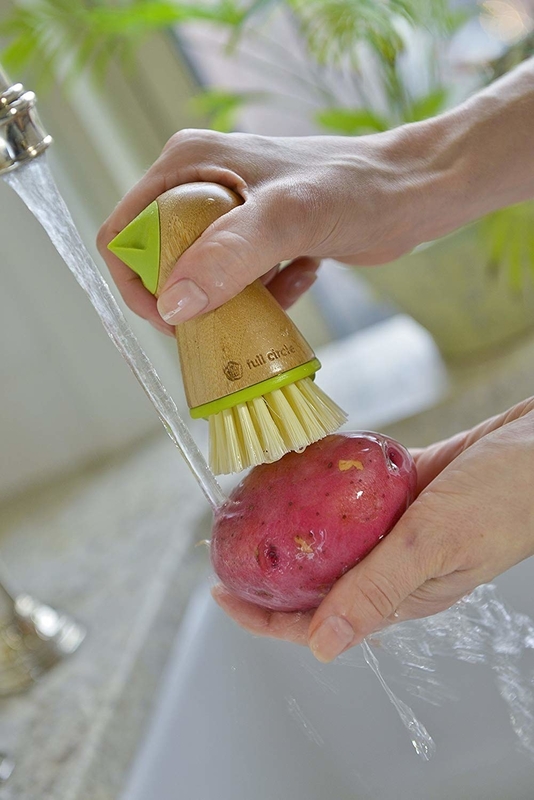 This useful gadget is dishwasher-safe for easy cleaning. 45. An apple slicer/corer to turn your big, juicy apple into the most delicious form — slices, DUH. 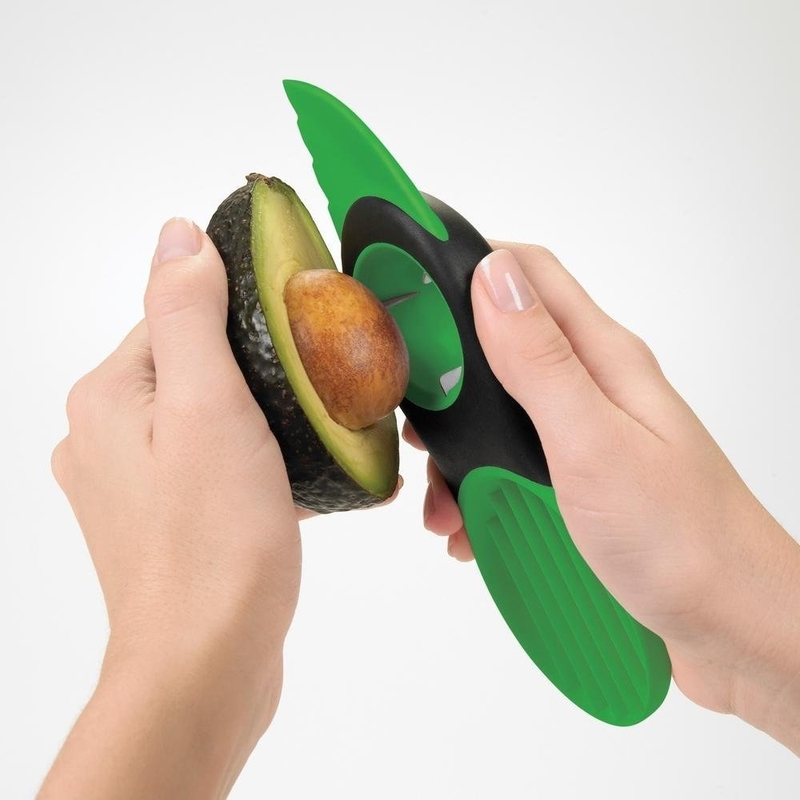 This baby will turn your fruit into 8 (or 16) even slices, while also removing the core. The cover that comes with it protects your precious hands from the blades, so that they can be used for other things, like eating your snack! Slicer is dishwasher-safe.